The Komodo National Park is a national park in Indonesia. It is on several islands in the Lesser Sunda Islands. 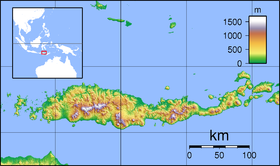 The park is in the area between the East Nusa Tenggara and West Nusa Tenggara provinces. The park includes three larger islands: Komodo, Padar and Rincah. It also includes 26 smaller ones for a total area of 1,733 km² (603 km² of it land). 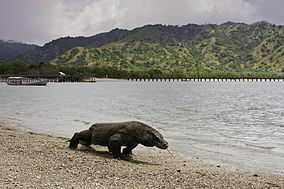 The national park was founded in 1980 to protect the Komodo dragon. This animal is the world's largest lizard. Later it began protecting other species, including some in the ocean. In 1991 the national park was named a UNESCO World Heritage Site. The park is spread over several islands. It includes part of western coast of Flores, the three larger islands of Komodo, Padar, Rincah, and 26 smaller islands. It also includes ocean areas such as the Sape Straights. The islands of the national park are volcanic. The land is generally rugged, with some rounded hills to 735m. The climate is one of the driest of Indonesia. Each year between 800mm and 1000mm of rain falls in the park area. Temperatures in the dry season from May to October are around 40 °C. The Park is hot and dry. There are many savannah plants that make it a good place for the Komodo dragon. Cloud forests are in only a few areas above 500 metres. These forests are good places for some local plants. There are mangrove forests in some of the quiet bays of the three larger islands. Large and complex coral reefs are along the north-east coast of Komodo. The park has many animals that live in the ocean, including whale sharks, ocean sunfish, manta rays, eagle rays, pygmy seahorse, false pipefish, clown frogfish, nudibranchs, blue-ringed octopus, sponges, tunicates, and coral. The island of Padar and part of Rinca were made nature reserves in 1938. Komodo Island became a nature reserve in 1965. UNESCO also began to protect the island in 1977. The three islands were named a national park in 1980,. The park was extended to include the nearby parts of the ocean and a part of Flores in 1984. In 1991 the national park was declared a UNESCO World Heritage Site. Since 1995, the national park authority has been supported by an American environmental organization called The Nature Conservancy (TNC). Komodo National Park has been selected as one of 28 finalists to become one of the New7Wonders of Nature. However, several fishermen died since the 1980s. People disagree about what happened to them. Park patrol and military said they needed to protect themselves. Fishermen living in the area say the park management killed the fishermen on purpose. Wikimedia Commons has media related to Komodo National Park. This page was last changed on 5 April 2019, at 14:23.